Algorithms for Indicating the Beginning of Accidents Based on the Estimate of the Density Distribution Function of the Noise of Technological Parameters. Automatic Control and Computer Sciences. Vol. 52, №3, pp. 231-242 (TR – 0,621). T. Aliyev, Musaeva N.F., Suleymanova M.T. Algorithms for forming correlaion matrices equiva-lent to matrices of useful signals of multidimensional stochastic objects. Applied and Computatio-nal mathematics. Vol. 17 №2, 2018, pp. 205-215. T. Aliyev, N.F. Musaeva, U.E. Sattarova, N.E. Rzayeva (TR – 2.365). Technologies and systems of noise control of the beginning and dynamics of development of accidents and their application in oil and gas production and construction. The 6th International Conference on Control and Optimization with Industrial Applications, 11-13 July, 2018, Baku, Azerbaijan, pp.19-21. T. Aliyev, O.G. Nusratov, N.F. Musaeva, G.A. Guluyev, F.G. Pashayev, A.G. Rzaev, U.E. Sattarova, Т.А. Alizada, N.E. Rzayeva. Noise Control of the Beginning of Accidents in Automatic Control Systems. 18th IFAC International Conference - TECIS (Technology, Culture and International Stability), 13th-15th September 2018, Baku, Azerbaijan. T. Aliyev, O.G. Nusratov, N.F. Musaeva, G.A. Guluyev, F.G. Pashayev, A.G. Rzaev, U.E. Sattarova, Т.А. Alizada, N.E. Rzayeva. Calculation Algorithms of the High Order Moments of Interference of Noisy Signals. Journal of Automation and Information Scien-ces, 2017, vol.50, Issue 6, pp. 1-13, by Begell House, New-York, Springer. 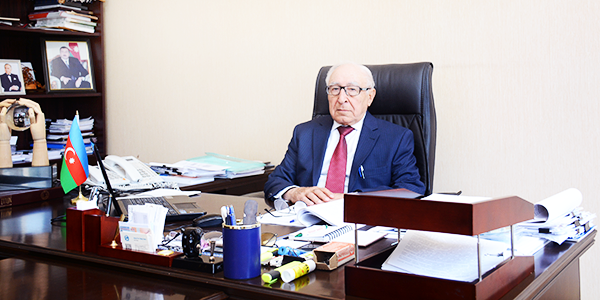 T. Aliyev, Musaeva N.F., Gazizade B.I. 2. T.A. Aliev, N.E. Rzayeva. Algoritmy spektral'nogo i korrelyatsionnogo analiza pomekhi sluchaynykh signalov v skrytom periode avariynogo sostoyaniya ob"yektov kontrolya (Algorithms of spectral and correlation analysis of noise of random signals in the latent period of emergency state of control objects). Mekhatronka, avtomatizatsiya, upravleniye, M., 2018, v.19, No 3, pp.183-193. 4. Equilibrumcustomer behavior in the M/M/1 retrial queue with working vacations and a constant retrial rate. Vol. 13., Operational Research. Springer. 2018. Melikov A.Z., Nam H.Do, Van Do T.
6. A method for diagnosing stenosis of the aortic valve of the cardiovascular system. Eurasian patent No. 028960 31.01.2018. A.G. Rzayev, G.A. Guluyev, Rzayeva N.E., Rzayev N.E. 7. Method and system for controlling the process of thermochemical dehydration of an oil emulsion. Eurasian patent No. 029244. 02/28/2018. Aliev T.A., Rzayev Ab.H., Guluyev G.A., Kelbaliyev G.I., Nuriyeva I.A. 8. Aliev T.A., Musaeva N.F., Gazizade B.I. Algorithms for constructing a model of the noisy process by correction of the law of its distribution. Automation and Information Sciences, 2017, Vol.49, Issue 9, p.61-75, by Begell House, New-York, Springer. 9. T.A. Aliev, N.F. Musaeva, B.I. Gazizade. Algoritmy postroyeniya modeli zashumlennogo protsessa putem korrektsii zakona yego raspredeleniya (Algorithms for constructing a noisy process model by correcting the law of its distribution). Mezhd.nauchno-tekhn. zhurnal «Problemy upraavleniya i informatiki”, Kyiv, 2017, No 5, pp. 56-68. 10. Method and system for automatic control of the level of separation of oil and water phases. Eurasian patent, No. 027715, 31.08.2017. Aliev T.A., Rzayev Ab.H., Guluyev G.A., Isayev M.M., Babayev S.F., Nuriyeva I.A. 12. Razrabotka algoritmov i programmnykh sredstv dlya vyyavleniya neispravnostey tekhnicheskikh ob"yektov na ranney stadii (Development of algorithms and software for the detection of malfunctions of technical objects at an early stage). "Proqram mühəndisliyinin aktual elmi-praktiki problemləri” I Resp. konf., mater., Bakı, 2017, 17 May. Musaeva N.F., Suleymanova M.T. 13. Tekhnologii vyyavleniya ranney stadii vozniknoveniya neispravnostey ob"yektov teplosnabzhe-niya po otsenkam kharakteristik pomekhi (Technologies for detecting the early stage of failure of heat supply facilities by estimating the noise characteristics). “Müasir istilik təchizatında proqressiv texnologiyalar” mövzusunda Respublika Elmi-Praktik Konf. mat.. Bakı, 8-9 June 2017, pp. 3-7. Musaeva N.F., Suleymanova M.T. 15. Algoritm identifikatsii dinamogramm shgnu po normirovannoy korrelyatsii (Algorithm for the identification of dynamometer cards of SRPU based on normalized correlation). ELEKTROPRIVOD, ELEKTROTEKHNOLOGII I ELEKTROOBORUDOVANIYe PREDPRIYATIY Sbornik nauchnykh trudov III Mezhdunarodnoy (V I Vserossiyskoy) nauchno-tekhnicheskoy konferentsii – Ufa: Izd-vo UGNTU, 2017.– pp. 619-624. Rzayev As.G., Pashayev F.G., Rezvan M.G., Aliyev Y.G. 19. Tekhnologii monitoringa i kontrolya tekhnicheskogo sostoyaniya shtangovogo glubinnogo nasosa (shgn) po otsenkam kharakteristik pomekhi (Technologies for monitoring and control of the technical condition of a sucker-rod pump (SRPU) based on the estimates of noise characteristics). Transaction of Azerbaijan National Academy of Sciences, Ser. of Physcal-Techn. And Math. Sciences: Informatics and Control Problems, 2017, vol. XXXVII, No.3, Aliev T.A. 21. Algorithms of building a model of the noisy process by correction of the law of its distribution Automation and Information Sciences, 2017, Vol., Issue, p.1-11, by Begell House, New-York, Springer, Musaeva N.F., Gazizade B.I. 26. Tekhnologiya opredeleniya robastnykh otsenok korrelyatsionnykh funktsiy sluchaynykh zashchumlennykh signalov (Technologies for determining the robust estimates of correlation functions of random noisy signals) Izmeritel'naya tekhnika, 2017, April, No4, pp. 27-31 N.E.Rzayeva. 27. Technologies for determining the robust estimates of correlation functions of random noisy signals Measurement Techniques 2017, No 4, pp. 27-31 (TR- 0,290) Rzayeva N.E. 29. Robust technology and system for management of sucker rod pumping units in oil wells Mechanical Systems and Signal Processing. Vol. 99 (15). 2018. P. 47-56 (TR - 4,116). A.H.Rzayev, G.A.Guluyev, T.A.Alizada, N.E.Rzayeva. 33. Method of measurement of oil well flow rate and the device for its implementation. Eurasian patent 14.10.2013 №201100991/31 Aliyev N.S. 34. Kompleks NOISE monitoringa, ranney diagnostiki i upravleniya protsessami mekhanizirovannoy dobychi nefti (Complex of NOISE monitoring, early diagnosis and management of artificial lift processes). “Riyaziyyatın tətbiqi məsələləri və yeni informasiya texnologiyaları" III Resp. Elmi Konf., Sumqayıt, 2016, 15-16 December Nusratov O., Rzayev Ab, Guluyev G., Rzayev As., Pashayev F., Aliyev YA., Rezvan M.
36. Method of determining reservoir deliverability. Eurasian patent № 024788, 31.10.2016 Rzayev A.G., Guluyev G.A., Kelbaliyev G.I. 37. Method of determining the reservoir pressure. Eurasian patent № 024713, 31.10.2016 Rzayev A.G., Guluyev G.A., Kelbaliyev G.I. 38. Təyyarələrin uçuşdan əvvəl Noise monitorinqi sisteminin işlənilməsi (Noise technologies in aviation). AEROEX 2016 Int. Aerospace Conference, Turkey, Kayseri, 13-16 October. Alizada T.A, Rzayeva N.E. 41. Method of monitoring of the activity of the cardiovascular and respiratory systems. Eurasian patent. № 024345, 30.09.2016, Rzayeva N.E. 42. Intelligent Seismic-Acoustic System for Identifying the Location of the Areas of an Expected Earthquake. Journal of Geoscience and Environment Protection, 2016, №4, рр. 147-162. Quluyev Q.A, Pashayev F.H, Sattarova.U.E, Rzayeva.N.E. 43. Models for indicating the period of failure of industral objects. Musayeva.N.F, Nusratov O.Q, Rzayev A.G, Sattarova.U.E. 44. Tekhnologiya formirovaniya robastnykh korrelyatsionnykh matrits matematicheskikh modeley dinamiki ob"yektov upravleniya (Technology of forming robust correlation matrices of mathematical models of the dynamics of control objects). Mekhatronika, avtomatizatsiya, upravleniye, M., 2016, No 3, v.17, pp.147-157. Musaeva N.F., Sattarova U.E., Rzayeva N.E. 45. Robastnyye tekhnologii opredeleniya otsenok korrelyatsionnykh funktsiy sluchaynykh zashumlennykh signalov (Robust technologies for determining estimates of correlation functions of random noisy signals) Avtomatizirovannyye tekh-nologiii proizvodstva, 2016, No1(11), pp. 41-49. Rzayeva N.E. 48. The location of invisible objects by the acoustic method. National Security and Military Sciences, 2015, No. 1, p.130-133, Hashimov, A. Pashayev, ES Sabziyev. 49. Development of a system of management and control of the technological process of drilling oil wells International Scientific Journal.Therotical & Applied Science, 2015, Issue: 12, vol. 32, p. 108-112. Mamedov F.I., Rzayev As.G., Mamedov J., Rasulov G.R. 58. Sistema diagnostiki i upravleniya SHGNU neftyanykh skvazhin s ispol'zovaniyem robastnoy Noise tekhnologii (Diagnostics and management system for oil wells operated by SRPU using robust Noise technology). Mekhatronika, avtomatizatsiya, upravleniye, M., 2015, No 10, v.16, pp. 686-698. Guluyev G.A., Rzayev As.G., Alizade T.A., Sattarova U.E., Rzayeva N.E. 59. Method and system of diagnostics of deep-well pumping units. Eurasian patent № 021804, 30.09.2015 Nusratov O.G., Guluyev G.A., Rzayev As.G., Pashayev F.G.
64. Method and system of diagnostics of deep-well pumping units. 23.10.2015 Rzayev Ab.H., Guluyev G.A., Rzayev As.G. 69. Obyektlərin statistik dinamik modellərinin identifikasiya-sını təmin edən robast texnologiyaların nəzəri əsasları (Theoretical bases of robust technologies that provide identification of statistical dynamic models of objects). Azərbaycan Milli Elmlər Akademiyası, Məruzələr, 2015, vol. LXXI, No3, pp.17-21. Musaeva N.F, Sattarova U.E, Rzayeva N.E. 71. Method of management of oil production process and device for its implementation № 019848, 30.06.2015 Rzayev Ab.G., Guliyev G.А., Rzayev As.G., Yusifov I.B. 74. Intelligent seismic-acoustic system for identifying the location of the focus of an expected earthquake AMEA Xəbərləri, Fiz.-Texn. və Riyaz. elmləri ser., İnformasiya və İdarəetmə Problemləri, 2014, vol. XXXIV, No3, pp. 3-24. A.M. Pashayev, A.A.Alzadeh, A.M.Abbasov, G.A.Guluyev, F.H.Pashayev, U.E.Sattarova. 75. Noise analysis of heart and lungs sounds by means of laptops and smartphones. AMEA-nın Хəbərləri, Fiz.-Texn. və Riyaz. elmləri ser., İnformasiya və İdarəetmə Problemləri, 2014, vol. XXXIV, No3, pp.25-36. N.E.Rzayeva. 77. Rezul'taty eksperimentov na skvazhinakh maloy glubiny seti RNM ASP stantsiy (Results of experiments on shallow wells in the network of RNM ASP stations) Seysmologiya, Mühəndis Seysmologiyası və ANTELOPE İstifadəçiləri qrupunun VI Beyn. Konf., Bakı, 2014 Guluyev G.A., Pashayev F.H., Sattarova U.E., Akhmedov I.A. 78. Robastnyye sistemy seysmozashchity i problemy ikh adaptatsii dlya arkticheskikh regionov Mat. Vtorogo yezhegodnogo seminara «Razvitiye Arkticheskoy zony Rossii: mezhdunarodnoye sotrudnichestvo, ekologicheskiye i sotsial'nyye problemy i ikh resheniya» (Robust seismic protection systems and problems of their adaptation for the Arctic regions. Proc. Second annual seminar "Development of the Arctic zone of Russia: international cooperation, environmental and social problems and their solutions"), S.-P., 26.09.2014 V.B.Mitko, T.A.lizade, G.A.Guluyev, V.V.Makarov, M.V.Minina, F.G.Pashayev. 83. Method of measurement of oil well flow rate. Eurasian patent №020663, 30.12.2014 Rzayev Ab.G., Guliyev G.А., Rzayev As.G. Yusifov I.B. 84. Method of measurement of oil well flow rate and the device for its implementation. Eurasian patent № 201101390 30.07.2014 Rzayev Ab.G., Guliyev G.А., Yusifov I.B. 85. Method of measurement of oil well flow rate and the device for its implementation. Eurasian patent № 201101389 30.04.2014 Rzayev Ab.G., Guliyev G.А., Rzayev As.G., Yusifov I.B. 86. Method of measurement of oil well flow rate and the device for its implementation. Eurasian patent № 20110099 28.02.2014 Rzayev Ab.G., Guliyev G.А., Rzayev As.G., Yusifov I.B. 87. Method of measurement of oil well flow rate and the device for its implementation. Eurasian patent № 201101389 30.04.2014 Rzayev Ab.G., Guliyev G.А., Rzayev As.G., Yusifov I.B. 88. Method of measurement of oil well flow rate and the device for its implementation. Eurasian patent № 20110099 28.02.2014 Rzayev Ab.G., Guliyev G.А., Rzayev As.G., Yusifov I.B. 95. Tekhnologiya formirovaniya normirovannykh korrelyatsionnykh matrits matrichnykh uravneniy mnogomernykh stokhasticheskikh ob"yektov (Technology for forming normalized correlation matrices of matrix equations of multivariate stochastic objects) Problemy upravleniya i informatiki, 2013, No1, pp.56-69 N.F.Musaeva, U.E.Sattarova. 96. A method of monitoring the technical condition of the compressor unit. Eurasian patent №018522 30.08.2013 Pashaev F.G., Guluyev G.A., Rzayev Аs.H.